Walker Evans 4 years, 11 months ago. Don’t think I’ve seen this here yet, so I figured I’d post it. Ohio State is in the middle of what officials call a $171.6 million shortcut to make room for more students on South Campus. 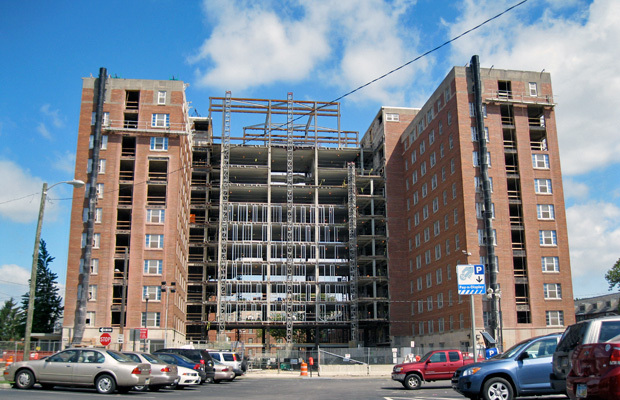 The project – dubbed the South Campus High Rise Renovation and Addition Project – will connect Park to Stradley, and Steeb to Smith, creating rooms for 360 more students by August 2013. “It’s basically building another building in between these two buildings,” said Scott Conlon, director of projects for Facilities Design and Construction. One such building will serve as a central lobby for Park and Stradley, and a similar building will provide a lobby to Steeb and Smith. Besides the new lobby and extra residence rooms in the existing towers, the project will add lounges and study rooms to the dormitories. I remember hearing about this a while back. Glad to see they’re moving forward on it. Ohio State University will keep two dorms closed after school starts this fall because of construction, a first that will cause hundreds of freshmen to be squeezed four to a room at other halls for the year. Drackett Tower and Scott House primarily served upperclassmen last year, but this year they’ll be freshmen-only dorms. Officials also put four students instead of two into most of the rooms, adding 350 beds to Drackett and 95 to Scott. I lived in a quad on north campus. It was tight, but it wasn’t that bad. I lived in one of the towers my first quarter freshman year. 4 to a bedroom, 4 bedrooms to a unit. Crazy crowded. That sounds bad, but this doesn’t involve the Towers (Lincoln and Morril). Both of which need major renovations themselves. I believe that’s in the near future plans. No, but 4 to a room is kind of ridiculous. Especially if you are charging full housing fees. A quick photo I took on Sunday. This really has sprung up quick! Photo update for anyone who hasn’t been through here in a little while. These look really nice!